Recently I have watched quite a few health documentaries. 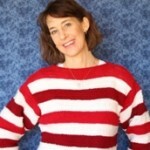 Good health is important to me and I like to be informed and keep up with the latest info on health. Here is a list of the health documentaries I have seen – some are available on Netflix and others I checked out from my local library. The library is a great source for books and dvd’s on health and well being, in my opinion. The above, Engine 2 Kitchen Rescue I found at my local library. 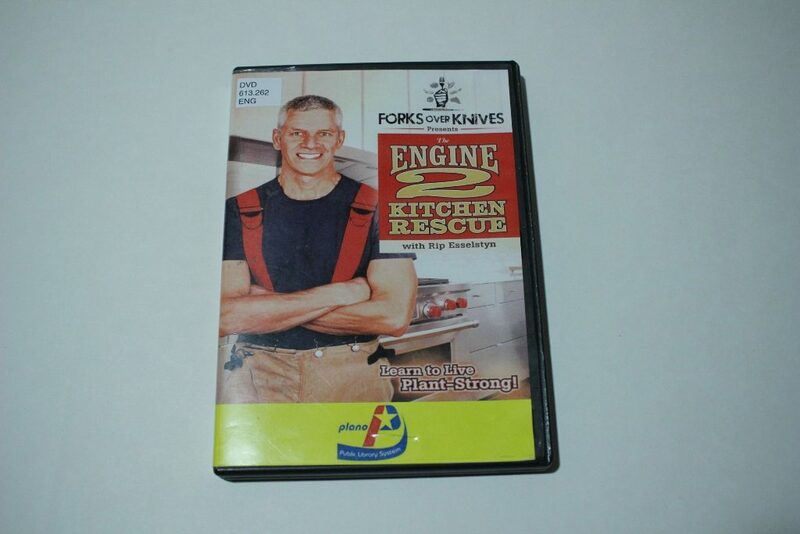 It is about a Texas firefighter, Rip Esselstyn, who eats a plant based diet and he goes to two different families homes to convert their pantries and their eating habits. I found it interesting and a good health documentary for someone looking to convert to better eating habits. 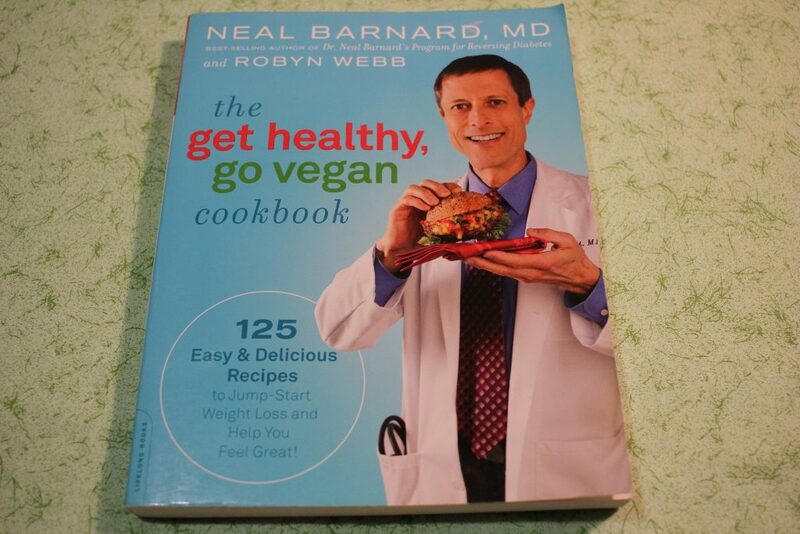 He has also written several books based on the Engine 2 Diet. I am on a wait list at the library for his newest book called The Engine 2 Seven Day Rescue Diet. If my library has the book then I like to check it out there first and see if it is something I am interested in buying. 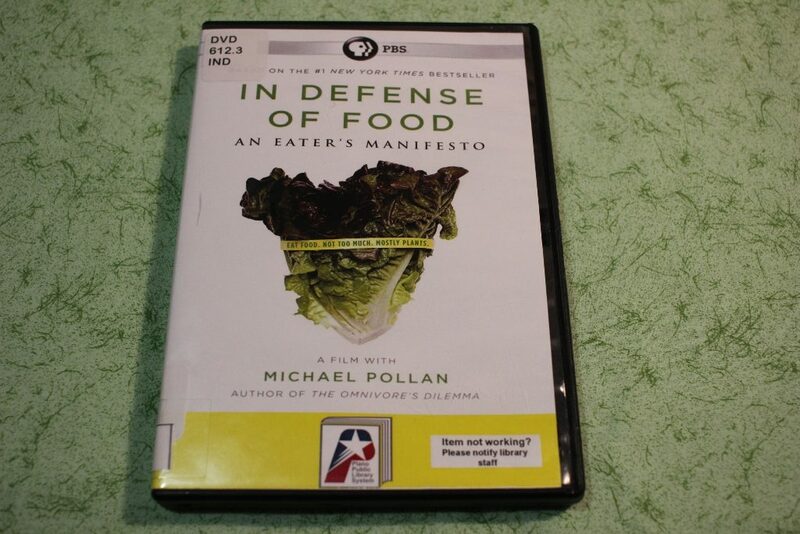 In Defense of Food is the most recent health documentary I have watched. I also found this at the library. This health documentary is a fairly recent release – it says 2015 on the back of the dvd case. I like the philosophy behind this which is “Eat Food – Not Too Much – Mostly Plants” -Michael Pollan. I find the information in this documentary reasonable and an easy to follow plan compared to some of the other health documentaries I have recently viewed. Overall, these health documentaries all have a common thread – too many people are not eating the right foods and the health of our children and society in general is suffering. If more people focused on eating a plant based diet, avoiding processed foods and excess sugar then there are many conditions and health problems that can be avoided, or even in some cases reversed, according to claims in many of the health documentaries I have recently watched. One of the reasons I have watched so many of these health documentaries lately is because I have an interest in maintaining good health and teaching my children to be healthy and be conscious of what they eat. Today there are so many food choices and lets face it – a lot of them are just really not that good for you. If I can influence my kids to have some idea of what is a healthy food and what isn’t then I feel like they are more likely to make better choices in the future as they get older. After watching the Plant Pure Nation documentary on Netflix I found out that there are several cookbooks that go along with the documentary. 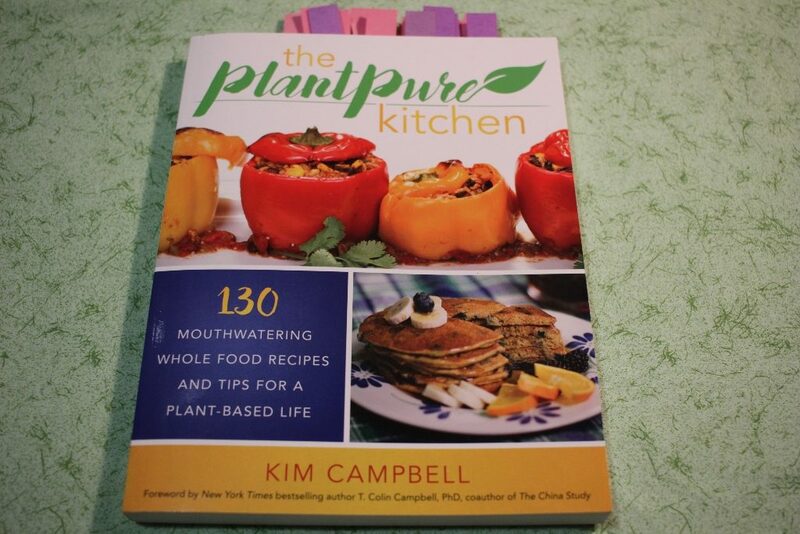 I found the one above, Plant Pure Kitchen, at Barnes and Noble a couple weeks ago. I have already made a few of the recipes and they are good. (As you can see I have several marked to try with sticky tabs) My kids even like the nacho cheese sauce which is actually made without any cheese or milk and tastes great. There is a page that explains how to build, or make, veggie burgers that is informative and there are a few veggie burger recipes in the book, too. I have been making my own veggie burgers for the last six months and really do not miss beef. The Get Healthy Go Vegan Cookbook was one I had checked out from the library and liked so I found it at Half Price Books last week and decided to purchase it. There are a lot of good recipes in this book as well and I have tried a few and enjoyed them. They are all plant based and easy to follow. So, as far as going Vegan – as it seems many of the health documentaries suggest as being the best diet – I am not there yet. I am trying to eat less meat each week and to be honest with you I don’t really miss it. I think going without any type of cheese or dairy is a little harder though. Also, my husband and my three sons are probably not going to be too thrilled if I totally quit cooking meat or buying cheese. It is hard to change habits of others – probably harder than changing your own habits. So for now we are focusing on eating more vegetables, fruits and whole grains and I am sneaking in vegan or vegetarian recipes when I can. This entry was posted in Health and tagged in health, health cookbooks, health documentaries, healthy eating, plant based eating.